How WordPress Website can do Wonders for your Business? When you first started your business, you probably did a lot of homework. You may even have consulted many advisors before investing a lot in terms of efforts, time and money to get your business off the ground. You have spent countless hours establishing your brand, creating your business and investing in marketing to reach the masses and strengthen your presence. And you feel like you can finally get your business running while delivering superior quality of products and services and take it to new heights. We live in the era of technology where a majority of people rely on their laptops and smartphones instead of paper and pen. While it is absolutely imperative and fantastic that you continue to offer excellent services to your clients, you need to take steps to open new opportunities for your business. For businesses who have managed to establish a successful presence and wondering how to take a huge leap and grow their business beyond its current status, setting up a website is the solution. Speaking of setting up a website, some of you may have heard of WordPress. Well, you don’t, we are here today to get you familiar with this popular platform to establish an online presence and how it can do wonders for your business. A lot of individuals still consider WordPress mostly as a technical software application that basically stimulates programming geeks and techniques like website designers and developers. Though it is absolutely understandable why you may feel this way, creating and managing your business online is as easy as pie with WordPress. Why choose WordPress over other platforms? As a matter of fact, WordPress powers more than 24.7% of the websites today and is trusted by millions of small and big businesses for their online business needs. 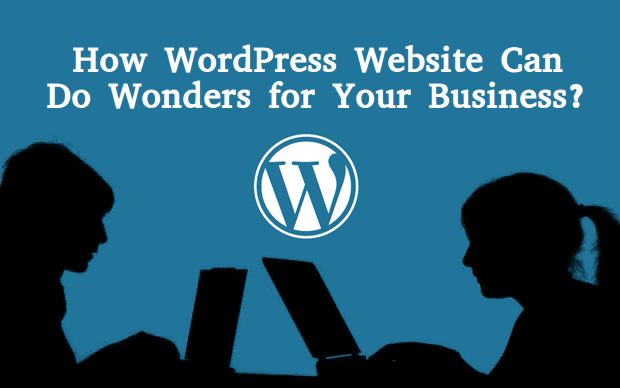 You do not have to be a programmer or an HTML coder to use WordPress for your business. WordPress is designed to be user-friendly and help non-programmers satisfy their perennial website needs. All you need is a working internet connection and a web browser to get started. It surely does include a learning curve, just like any other platform, but it does not have a steep learning curve. This means, once you get a hang of it, you will have your website up and running in about few hours. It allows you to add as many web pages as you want without having to write even a single line of code. There is no denying the fact that WordPress started out as a blogging system but over the years, it has evolved itself into a feature-rich Content Management System. This means you can use this platform for your entire website, not just for a blog. The best part of using WordPress for your business is its visually stunning themes that enable you to create beautiful and fully functional websites without hiring a skilled web designer. The CMS allows you to choose between a free and premium theme depending on your budget and requirements. WordPress has more than 1,653 free themes in the official WordPress theme directory. However, there are various theme providers available in the marketplace with thousands of premium and free themes such as inkthemes, WooThemes, StudioPress, ThemeForest, ElegantThemes and so much more. So, you can never run out of themes for your online venture. According to a statement by Matt Cutts, a Google Engineer, “WordPress automatically resolves a variety of SEO issues.” And with the dozens of SEO plugins offered by WordPress, you can make your website SEO-friendly without even knowing the fundamentals of SEO. Like SEO plugins, WordPress also offers an assortment of Social Media plugins that make your site social media friendly and allow you to drive traffic from these platforms. Jason is a WordPress Developer by profession and write by hobby. He is associated with Wordsuccor Ltd. and has a lot of experience in converting PSD websites to WordPress. If you are looking for WordPress expert, Jason can be a good choice.He has delivered numerous range of quality products related to this. He has a strong passion for writing useful and insights about WordPress tips and tricks.